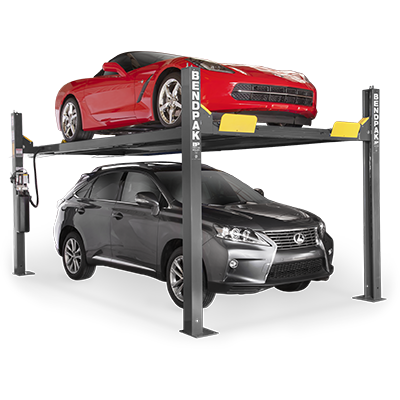 When your garage isn’t cramped for space, you have more lifting options. The HD-9XW is made for the garage with a generous ceiling height, so high-rise vehicles can park on the lower level. Unlike our narrow-width HD-9ST four-post lift, this model comfortably holds wide-body trucks and SUVs without you having to worry about scratching up the mirrors or doors. With 82” of rise out of the runways, you can lift those heavy machines higher, leaving more room for taller mechanics to operate underneath. There’s also more room to park high-clearance trucks and SUVs. This eliminates the disappointment of buying a new lift and discovering your taller vehicle won’t even fit underneath.